Another well-known Vinh Hung 2 Hotel is the property of Vinh Hung management systems and is situated along the road to the ancient Hoi An Town. Vinh Hung Hotel is a modified Chinese trading house with 3 floors. Vinh Hung 2 Hotel surrounded by luscious well landscaped gardens offering all the modern creature comforts. And the view over the rice fields will make you feel a part of the local and peaceful surroundings. A touch of class in Hoi An. 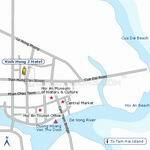 Vinh Hung 2 Hotel is located on the gate of Hoi An. It is 4 km away from Cua Dai Beach. Only 200 m to the center of Hoi An and 10 minutes walking to sites such as the Japanese covered bridge, Cantonese Assembly, Phuc Kien Assembly Hall and Hoi An museum. Drive time from Danang International Airport to the Vinh Hung 2 Hotel is approximately 35 minutes. First class: 15 small rooms, in which 9 in ground floor rooms have big window with street view, others 6 rooms have balcony with swimming pool view and street view; 16m2. Suite: 20 rooms with 2 big balcony, 8 rooms with street view and 12 with swimming pool view; 20 m2. Vinh Hung Restaurant: serve in the best local Vietnamese Cuisine. Swimming pool: in Vinh Hung 2 is about 45 m2, with a constant water filter and a depth of 2 meters. The hotel has 3 wide stairs and airy corridors. Business center: Souvenir shop, Postal and parcel service.